In this example, we'll use regular expressions to performing what is sometimes called HTML scraping or screen scraping. Namely, we want to extract some data from a web page. We'll concentrate on HTML data, but essentially similar expressions can actually be used to scrape XML data (for example, from an RSS feed). Using regular expressions to scrape data has the advantage that it is easy to make the expression cope flexibly with "broken" HTML. Many libraries designed to interpret HTML and/or XML (including the standard DOM API now part of the JDK) are often too "fussy" for the real world, where most web pages and XML documents are actually badly formed in some way or other. 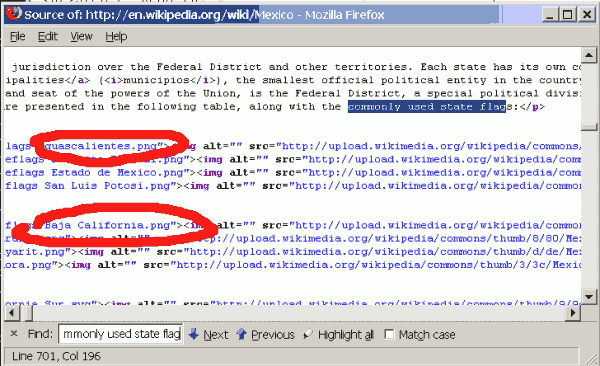 As an example, we're going to scrape a page of Wikipedia to pull out a list of all the names of states in Mexico, along with the URLs of corresponding Wikipedia entries. Step 1: Find where the data is! And looking at the table, we see that the first names are Aguascalientes and Baja California. At the time of writing, the text directly before the table reads "...along with the commonly used state flags:". We probably want to take note of this text too, to help us find the data in the HTML source code. create a capturing groups for the pieces of data we're actually interested in. We've replaced a space inside a tag with \\s+, to match against any whitespace sequence, since we know that any sequence of spaces, newlines and tabs would actually be acceptable here. This is just good practice, in case there was variation in the HTML code (there actually isn't in this example). We use the sequence [^>]* to mean "anything between here and the end of the tag" (in actual fact, zero or more characters that are not close tag symbols): again this is just good practice, to cope with any unexpected additional attributes that we're not interested in. Here we use the dot followed by a star to mean "match any number of any character, provided the rest of the expression still matches". But we also add a question mark. This performs a reluctant match: in other words, it will match the smallest number of characters possible, while still making the rest of the expression match. This effectively prevents . * from also matching against an instance of </span>: we want to find the first span close tag that comes next in the HTML sequence. Notice that we must escape (write \" for) quotes inside quotes, and subexpressions such as [^\"]* to mean "the next sequence of characters that does not include a quote". encoding of ISO-8859-1, but in fact, Wikipedia appears to use UTF-8. Et voilà! We have now extracted the list of data that we need from the HTML page.